Home improvement and DIY are like a national pastime. Each bank holiday weekend the big DIY stores really make their money; we drive out in hordes to pile up on the necessary equipment, tools and materials to do the bathroom up. The other half has been nagging for month and you finally decide that to keep the peace you shall endeavour to spend your well-earned extended weekend doing yet more work. Well, should you be looking to carry out some work to your bathroom, we have on test three wall tiles which aim to do a perfect job of sprucing up your humble abode. When it comes to choosing tiles most will people will concentrate on two things, price and looks. The Natural Stone Effect tiles are a British made tile that would suit any newly renovated property, they have the colour quality of a buy to let property bathroom and wouldn't offend many who came in to the bathroom. The set is 20m2 and the tiles themselves are fairly average in size and come in at around 330x250 which we think is a good size. The pattern which they use is apparently a Rot colour system which means that you shouldn't find the pattern replicating itself over and over so you get a random pattern effect instead of a boring paint by numbers effect. The effect these tiles are going for replicate the Natural stone are honed and filled, but these can be extremely expensive. We have to say that these do a pretty good job of portraying the desired effect and look impressive just in the hand, let alone before they're put up. The set comes with a border set of tiles which is rather detailed and sets of the set just with the right amount of detail. You can expect to pick up a set this size for around £300, which is enough to tile out a small to average size bathroom. The adhesive that comes with the tiles isn't recommended and you'd be advised to purchase a better quality adhesive to make sure your tiles stick as best they can. Similarly to the Natural Stone effect tiles, there are the Travertine Effect Ceramic tiles that you will also be able to pick up for around £300 for 20m2. These tiles are bigger however and suit a rather larger bathroom; they wouldn't really go well in a small bathroom, the tiles would simply look too big. The effect pattern of the travertine tiles is a slightly lighter tone and less apparent pattern. The tiles look brighter and once on the wall, they appear to give the room more light. This is an important consideration because if you want a bathroom that is sombre and quite low tone in mood then these probably aren't for you. Should you want a bathroom with brightness and you have a window or even several, these will allow that light to reflect around the room. The Border that comes with this set is a darker tone and sets off well against the lighter tiles and sits three tiles high from the floor. The Natural Stone Effect Grade 1 tiles are almost identical to the first set of natural stone we talked about. However, they are made from a much higher grade of ceramic and comes with real marble that makes up the border. For £50 extra you're getting a better grade of tile and certainly a better grade of border. However, we couldn't tell much difference when looking at them, but the finish and touch was far better. Should you want a new bathroom, these three tiles will certainly bring a fresh palette. 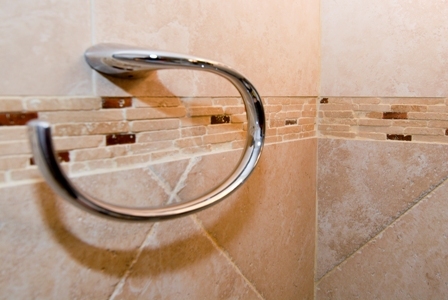 The Travertine effect tiles were excellent in bathrooms with a lot of light, although they were not the best quality. If you're after tiles for bathroom with no windows, you'll probably want to stick to the Natural Stone effect because they're cheaper than their grade 1 quality cousins and look very much the same.